Yes, "baked barbecued" baby back ribs is an oxymoron, because if you bake ribs, you are certainly NOT barbecuing them. When time and/or weather prevents us from getting to the smoker, though, this oven method for barbecued baby back ribs works great. Combine rub ingredients in a small bowl and mix. Place each rack of ribs in the center of its own large piece of heavy-duty aluminum foil and apply the dry rub to each side of the two racks (more so on the meat side). Wrap each rack in foil and place the two foil-wrapped racks on a baking sheet and place in oven. Remove the ribs from oven, and, using tongs, open the foil. Place racks on one piece of the foil and brush barbecue sauce on both sides. Turn up the oven temperature to 350 F.
Return ribs to the oven. Continue cooking, brushing on more barbecue sauce occasionally, until the ribs are fork tender and well glazed, about 30 to 45 minutes. Remove and let rest for 15 minutes before cutting and serving. 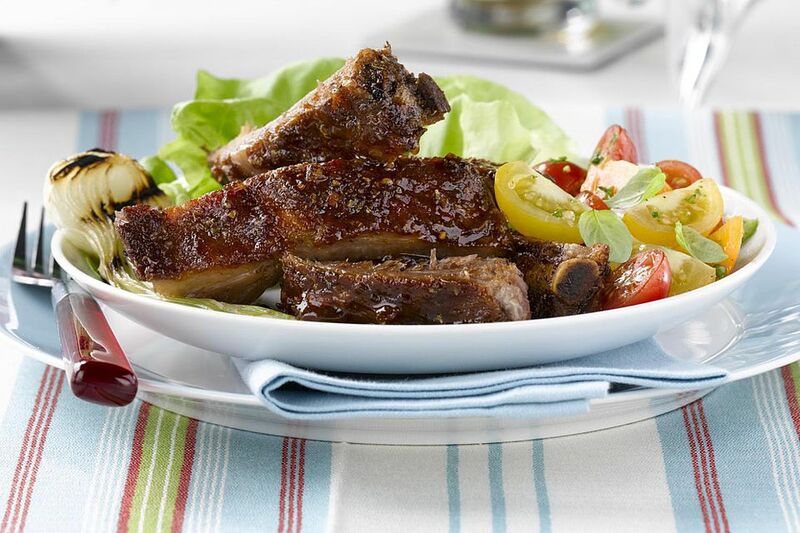 Cut ribs can be tossed in additional sauce if desired. Pair with your favorite sides, like potato salad, macaroni salad, mac and cheese, green salad, or corn and enjoy!